MotionPhone is a new form of communication and a creative game. It lets people make abstract animations together over a network in a unique combination of conversation and creation. In MotionPhone’s shared infinite canvas, people can create unlimited variations of movement by recording the gestures from their fingertips. When connected to other players, MotionPhone lets you create, comment, play, and communicate visually with others. 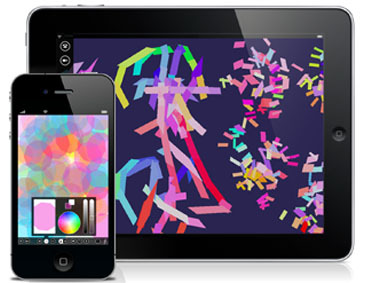 •Interactive animated canvas with up to 30,000 animated brushstrokes. •Selection of color, shape, transparency, speed, zoom, frame rate, and translation across an infinite plane. •Networked connection with a friend over local networks, or animate alone. •Create animations simply by moving ones fingertips. •Save and load your creations, and post to Facebook, Twitter, or email. •Play music while you animate. Motion phone was the first interactive networked work of art, created by Scott Snibbe between 1989 and 1996, and exhibited in galleries and museums worldwide. Now it is an iPad app accessible to anyone in the world!